Synopsis- Felicito Yanaque has raised himself from poverty to ownership of a trucking business. His two sons work for him. He receives a threatening letter demanding protection money. The police don’t take him seriously, Felicito refuses to pay up and gets sucked into a nightmare. He becomes a reluctant public hero. Then his mistress is kidnapped, and matters become seriously complicated. And he finds that his troubles have begun very close to home. 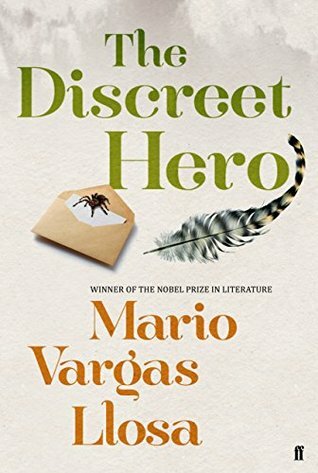 Review- The Discreet Hero is the Nobel Prize Winning title by Mario Vargas Llosa, which was translated from Spanish to English in this edition. The South American setting and the award credentials attracted me to this book. In the first couple of chapters we are introduced to the main cast of characters with two parallel storylines that later intersect. Felicito Yanaque is a successful trucker businessman who is content with his life; he has a wife, two adult sons and a young mistress named Mabel. Until he receives a blackmail letter suggesting he pays an ongoing ‘insurance’ or else he may experience problems. A usually quiet and non-confrontational man, his inner pride is challenged and he declares that he will not let these people walk all over him. A value deeply installed in him as a child. He reports the matter to the police immediately and when another letter arrives, he publicly shames them in the local newspaper. When his business is burned to the ground and his beloved Mabel is kidnapped Felicito must decide whether to give in or fight for his rights. Meanwhile, following a near-death experience, successful insurance business man Ismael has decided it’s time to retire. Not only will he retire, but he will marry his much younger servant Armida and do everything in his power to wipe out the inheritance of his despised twin sons. The marriage is witnessed by his driver and also good friend Rigoberto. Following the wedding, he leaves for Italy for an extended honeymoon while his friends suffer the backlash of his sons’ rage. Rigoberto’s life is turned upside down as he’s threatened by Ismael’s sons. While he and his wife deal with the unusual circumstances of their son’s new friend. The Discreet Hero is slow to start and actually quite slow to finish too! It didn’t quite live up to my expectations and perhaps this is partly due to the translation or maybe just the way in which it’s written. There are plenty of dramas that happen throughout the story but they didn’t have much of an impact on me because of the way they were revealed; usually via a character relaying what happened, rather than the reader being swept up in the moment by the action. This is the biggest downfall, in my opinion. The two main characters Felicito and Ismael were quite similar, both with two sons and deceit in the family. I’d have liked to see a bigger contrast between the two. I’d also expected Peruvian politics and the social situation to play a bigger role in the story, but even this felt dampened down. Overall, I didn’t enjoy this story as much as I’d hoped but it was interesting in terms of the setting and the secret lives of the characters.